For readers of Unbroken comes an unforgettable tale of courage from America's "forgotten war" in Korea, by the New York Times best-selling author of A Higher Call. 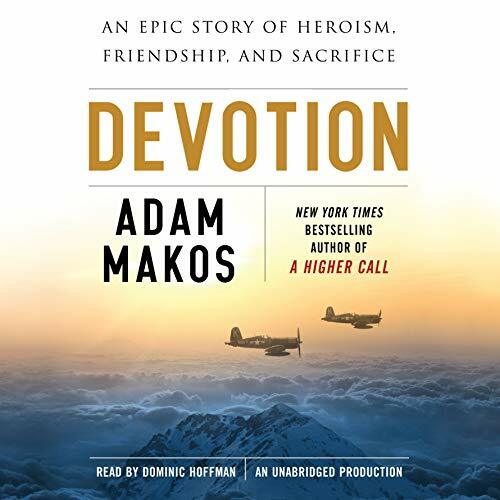 Devotion tells the inspirational story of the US Navy's most famous aviator duo, Lieutenant Tom Hudner and Ensign Jesse Brown, and the marines they fought to defend. A white New Englander from the country-club scene, Tom passed up Harvard to fly fighters for his country. An African American sharecropper's son from Mississippi, Jesse became the navy's first black carrier pilot, defending a nation that wouldn't even serve him in a bar. While much of America remained divided by segregation, Jesse and Tom joined forces as wingmen in Fighter Squadron 32. Adam Makos takes us into the cockpit as these bold young aviators cut their teeth at the world's most dangerous job - landing on the deck of an aircraft carrier - and a line of work that Jesse's young wife, Daisy, struggles to accept. Deployed to the Mediterranean, Tom and Jesse meet the Fleet Marines, boys like PFC "Red" Parkinson, a farm kid from the Catskills. In between war games in the sun, the young men revel on the Riviera, partying with millionaires and even befriending the Hollywood starlet Elizabeth Taylor. Then comes the war no one expected, in faraway Korea. Devotion takes us soaring overhead with Tom and Jesse and into the foxholes with Red and the marines as they battle a North Korean invasion. As the fury of the fighting escalates and the marines are cornered at the Chosin Reservoir, Tom and Jesse fly, guns blazing, to try to save them. When one of the duo is shot down behind enemy lines and pinned in his burning plane, the other faces an unthinkable choice: watch his friend die or attempt history's most audacious one-man rescue mission.